500th anniversaries don’t come around often, and we have certainly taken full advantage of this one. This year’s commemoration of the Reformation has enabled us to partner with local historians, the Salisbury Symphony, Piedmont Players, The Landesbuhnen Sachsen, and the the Ensembles Nobiles, both from Saxony, Germany, birthplace of the Reformation. Appropriately, our schedule of events concludes with a Lutheran-Catholic dialogue between St. John’s and Sacred Heart Catholic Church in Salisbury, beginning in November. The dialogue will explore our commonalities and our differences, using the recently published “Declaration on the Way” as our guide. The Declaration is the product of 50 years of conversation among Lutherans and Catholics. The highlight is a list of common practices and theological statements that draw us together as one. Father John Eckert and I are looking forward to the dialogue. We’ve enjoyed meeting these last few months to explore ways that our two congregations can grow together in the spirit of love and common purpose. We’ll begin November 14 at St. John’s, meet at Sacred Heart on December 5, and conclude with a covered dish dinner and panel conversation on January 9. Joining us on the panel will be professors from Lenoir-Rhyne and Belmont Abby to discuss the future of Lutheran-Catholic dialogue. It’s important to note that we very carefully avoid using the word “celebration” in connection to the Reformation. It’s a commemoration — the commemoration of an event that ultimately, and necessarily, divided the church. If there is any celebration at all, it’s in the way the church has recently been finding common ground by taking seriously Jesus’ prayer that we might all be “one” (John 17:22). Thank you for your attention, enthusiasm, and attendance during this Reformation 500 year. 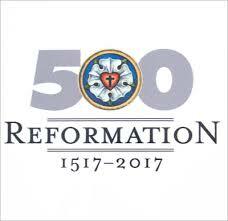 I sure hope to see you at the play in October, our Reformation 500 worship event on October 29, and for the Lutheran-Catholic dialogue in November. Blessings to you and your family. What a privilege to be partners in ministry.